The combination of beans, greens, some sort of meat and stock, is my go-to base for an easy, hearty soup dinner, perfect for a winter weeknight. I really enjoy making all of the long-cooking parts — chicken stock, beans — from scratch so I have the most control over seasonings. Thankfully, both can be cooked up ahead of time and refrigerated for up to a week (the stock can be frozen for several months), so a from-scratch (bonus points if you make your own sausage! ), healthy, flavor-packed meal can be on the table in thirty minutes or less. This soup is quite spicy — use sweet Italian sausage and/or eliminate the red pepper flakes if you prefer more mild heat levels — making it an even better way to warm up on a chilly evening. (If using precooked beans, skip ahead.) Drain and rinse soaked, dried beans. Place in a 4 quart (or larger) pot, cover with 2 quarts (32 ounces or about 2 liters) water, add sprig of rosemary (no need to remove leaves from stem), and set over high heat. Bring to a hard boil and cook for 5 minutes, stirring occasionally. Cover pot, reduce temperature to low and simmer beans for about 2 1/2 – 3 hours or until softened (may take more or less time depending on the age and size of your beans). Drain beans in a metal colander, rinse with cold water to stop cooking and remove rosemary stem and leaves, allow excess water to drain off while you make the soup. DO AHEAD: Dried beans can be cooked, rinsed and drained very well up to a week in advance. Store, covered, in the refrigerator until ready to make soup. In a 4 quart pot, heat olive oil over medium-low heat until shimmering. Add garlic to oil, cook just until it begins to color. Sprinkle in red pepper flakes and add sausage balls in a single layer. Increase heat to medium, and continue to cook until sausage is browned in spots (instead of stirring, I occasionally shake the pot from side to side to get the balls to roll around and cook on more than one side). Stir in chopped rosemary, cooked beans and chicken stock; bring to a simmer. Stir in kale and cook just until tender. Serve immediately with a generous sprinkle of Pecorino or Parmesan, then add salt to taste if necessary. 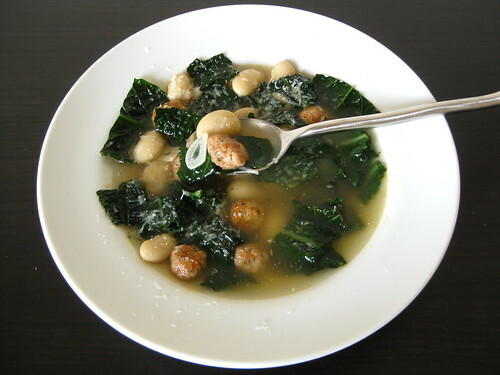 This looks gorgeous – I have fallen in love with kale since my CSA introduced me to it, and lately I’ve had a craving for cannelini beans 🙂 This gets both into one beautiful dish! Thank you! I fell in love with it from a CSA box, too — so much so that I started growing it in my container garden this year (it is one of the most hearty, forgiving plants I’ve ever grown). I have zero garden space (apartment building, not even a balcony), so for now CSA-kale it is. But I hope to one day have enough space in- or outside to start a garden again! Btw, there’s a tiny surprise for you waiting at my blog today. One of my favorite soups have never had Kale and always use escarole your photo has inspired me to try it and congrats on Top9! Kiri: Ooh, I see. We lucked out and have a deck plus an extra bit of walkway in the front of our apartment — during the peak of summer the plants quite literally attack us. (I’m thinking of one, overgrown cherry tomato plant in particular that we would trim/tie back constantly then all of a sudden would grow overnight. I was bopped upside the head on more than one occasion as I sleepily exited to walk the dog in the morning.) One day! And thank you again :). Pegasuslegend: I highly recommend it — there are so many varieties to choose from, but I like the Tuscan variety best (seems to hold up to cooking better than most). I’ll have to give it a go with escarole some time — I absolutely love the endive family!